BOOM! Studios today announced it has acquired the comic book and graphic novel publishing license to THE MAGICIANS, the award-winning, New York Times bestselling adult fantasy novel series created by Lev Grossman, which has become a worldwide pop culture phenomenon and inspired a hit television series on Syfy, whose fourth season will premiere in 2019. Originally published in 2009, THE MAGICIANS introduces readers to Brakebills College for Magical Pedagogy, which boasts a prestigious and dangerously difficult curriculum, famous and infamous alumni, and a record of only…a few deaths per graduating class. The first release in this partnership will be THE MAGICIANS: ALICE’S STORY, an all-new original graphic novel hardcover set in the world of the book trilogy by Grossman, from acclaimed writer Lilah Sturges (Lumberjanes: The Infernal Compass, Jack of Fables), rising star artist Pius Bak and featuring a cover by Steve Morris (Buffy The Vampire Slayer). Debuting in July 2019, THE MAGICIANS: ALICE’S STORY expands the mythology of The Magicians, the first novel in the series trilogy, through the perspective of lead character Alice Quinn before she joins Brakebills and embarks on an epic journey in the magical land of Fillory. Alice is manifestly brilliant, and she’s always known that magic is real. During her years at Brakebills Alice rises to the top of her class, falls in love with Quentin Coldwater, and witnesses a horrifically powerful magical creature called the Beast invade their dimension. Soon after graduation, Alice and Quentin set their sights on the idyllic setting from their favorite children’s books, Fillory. In Fillory, magic flows like a river but even with talking animals, enchanted items, and the chance to become king and queen of a magical land in the offing, nothing is what it seems and something far darker lies in wait behind the spellbinding facade. Now fans will learn untold secrets of Alice’s journey, the world of THE MAGICIANS, and will find answers to some of their biggest questions. "Usually when your work is being adapted, you just hope you'll end up with something reasonably faithful to your vision,” said novelist Lev Grossman. “You never expect to have that vision turned around and expanded to reveal incredible new things you never even knew were there. But that's what happened with ALICE’S STORY." 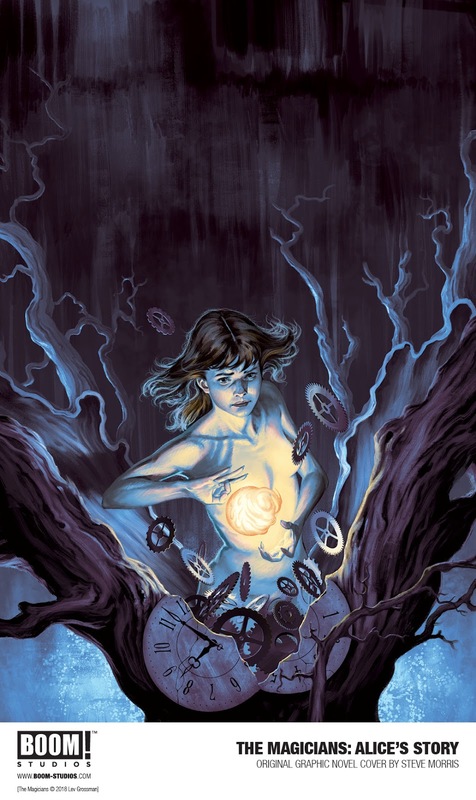 THE MAGICIANS: ALICE’S STORY is the latest release from BOOM! Studios’ eponymous imprint, home to a world-class group of licensed comic book series and ambitious original series, including Joss Whedon’s Firefly and Buffy The Vampire Slayer, Abbott, Mech Cadet Yu, Grass Kings, and Bone Parish. at local comic book shops (use comicshoplocator.com to find the nearest one), bookstores or at the BOOM! Studios webstore. Digital copies can be purchased from content providers, including comiXology, iBooks, Google Play, and the BOOM! Studios app. For continuing news on The Magicians comic books, original graphic novels and more from BOOM!, stay tuned to www.boom-studios.com and follow @boomstudios on Twitter.